I really do lose all control during parties, weddings and holidays. Bums me out, but I just go back to normal the next day. I tried really hard not to eat fatty foods and candy on Valentine's Day. I started my day with a spinach smoothie and every intention of grilled chicken salad for lunch, but my husband treated us to Chinese. I ate General Tso's like it was going out of style and then felt really crappy (It makes me feel sluggish and I often feel the need to quickly go to sleep. I think due to a MSG allergy). Later, I ate crab legs with my son and this is not so bad. They are his absolutely favorite and the least I could do for Valentine's Day dinner ... I REALLY enjoyed them as much as he did :) I also had my fair share of chocolate :( I did not put on any weight, though I did not lose any yesterday either. How did you do? This would be ok for someone trying to maintain 220 lbs (like a man), but WAY too much fat and way too many calories than I like to have as my total for the day. It is just not healthy for me and I might have eaten more if not taking Skinny Fiber yesterday (like potato, salad w/ dressing and vegetable with the crab legs) ... This is too much for me even if I was working out every day ... Look at my food list again. The General TSOs was my only complete meal according to the government suggested food guides. Can you imagine what my calories would have been if I had bacon, eggs w/ cheese and toast w/ butter for breakfast, as well as a potato with butter and sour cream and anything else with my crab legs? * 1 pound of fat is equal to 3500 calories - This is why I did not gain a pound. Do you think of and measure your food intake like this? Do you know how many calories your body needs to maintain your current weight? Do you know how many calories you need to eat to lose weight if you do not exercise? Do you know how many calories you can eat to lose weight if you do exercise? If not, you should learn how to calculate this for yourself. Use this calorie calculator to see how many calories you should eat a day to maintain, and then start reducing it. It is not suggested to go below 1200 calories a day. Looking back to yesterdays food intake, the General TSO's was more calories than the chocolate, but had I ate a proper portion of the General TSOs (1/2) and one piece of chocolate, my caloric intake and energy would have been much better yesterday. I like feeling energetic and healthy; no sluggish and like I am abusing my body. Dieting and weight loss is not about starving or deprivation; eating right and adopting a healthy lifestyle is about making the right choices for our bodies. It is not easy for me to always do what is right for my body and life, but I sure feel terrible the next day and get right back on track. 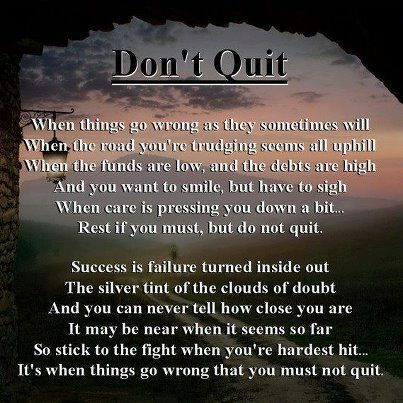 QUITTING IS NOT AN OPTION FOR ME ... DO YOU FEEL THE SAME WAY?